Today was Sunday and I shall not lie – I slept in rather late. And it was glorious. Not wanting to fight the ravenous Ann Arbor brunch-seeking crowds at that hour, we decided to head across town to try a new-to-us café for breakfast. 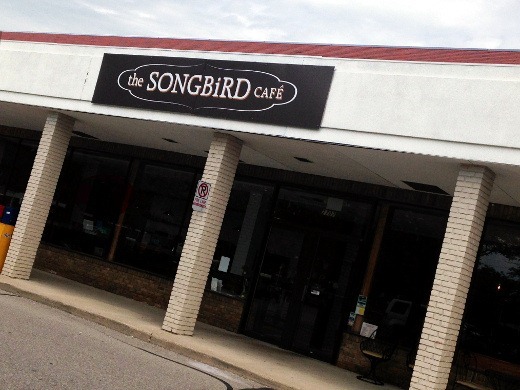 The Songbird Café has resided in the Plymouth Road Mall plaza location for just a little over one year now. I’ve heard many good things about the café, including having seen many tasty Instagram pictures, which ultimately motivated me to visit. I would have never guessed that the interior of this plaza café was so beautiful! Gorgeous finishes cover the entire interior, from rustic wooden beams framing the rooms, to textured fresh, white wall paneling, wrought iron chandeliers, dark granite counter tops at the check-out, and crisp, shiny subway tiling. 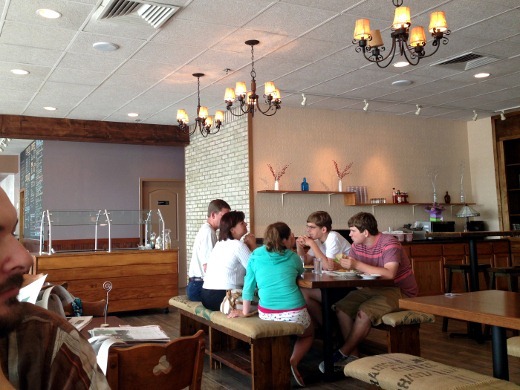 Many different seating options are available, including high-top bar seats, picnic table-like seating with burlap-padded benches, traditional four tops, and cozy chairs with eccentrically shaped coffee tables. Whether you’re coming in for a meal, meeting a friend for coffee, or need free Wi-Fi and a chill place to study, The Songbird Café has plenty of options. 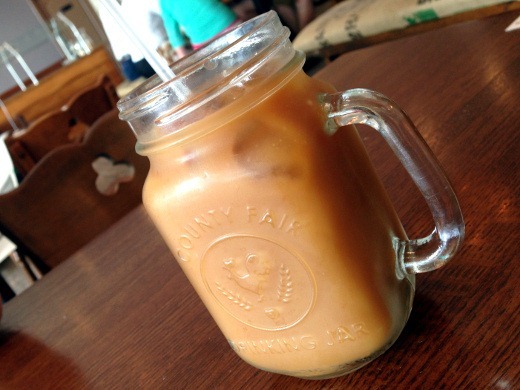 My favorite detail: my iced cold brew coffee was served in this charming, handled mason jar. Let us take a moment to admire the mug. Also the coffee was strong and delicious. Food and drinks are ordered at the front counter. Customers are then given a table number to display in the holder at their table, and brought their food when it is ready. Our food arrived hot, and in a very reasonable amount of time after ordering. The huz and I were very hungry and both ordered one of the day’s specials: The Southwestern Omelet with Home Fries. 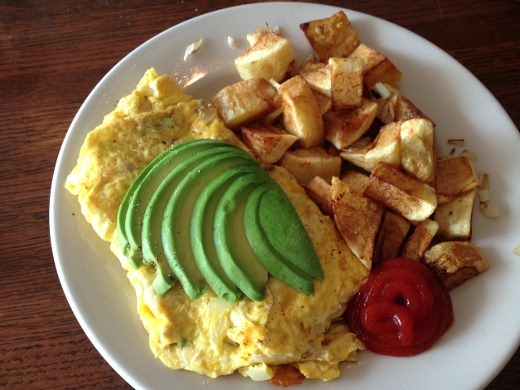 This fluffy omelet was filled with cheddar, multi-color bell peppers, cheddar, and sausage, and topped with a generous portion of avocado. I loved the fluffiness of the omelet and the abundance of veggies but I would have liked more, and larger, bites of sausage in the omelet. The home fries were crisp on the exterior and soft inside, but could have benefitted from a tad more seasoning. ..Though, I ate them all, so I still found them rather tasty! The portion size was moderate for the price. Perhaps a bit steep compared to other local brunch spots. I might have liked some toast or a side of fruit included with the omelet for the price. 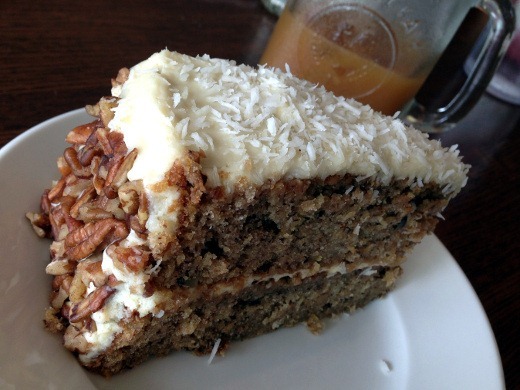 We really wanted to try one of the many enticing baked goods displayed at the front counter, and ordered a slice of hummingbird cake to share. The cake was moist, with a rich cream cheese frosting, and lots of crunchy pecans. 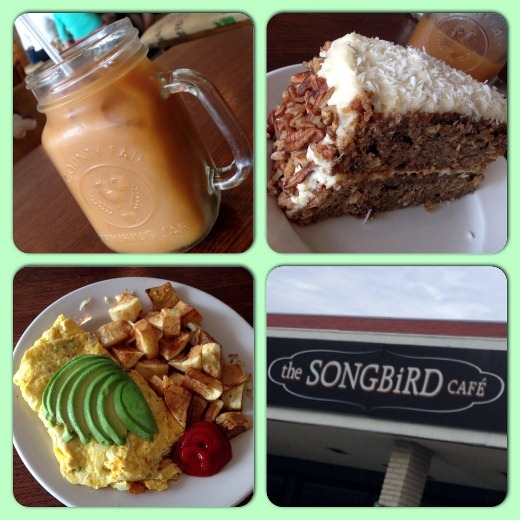 The Songbird Café is so very cute! It’s also a good option for breakfast when I sleep in too late to go to one of my usual brunch “standards” without a long wait. 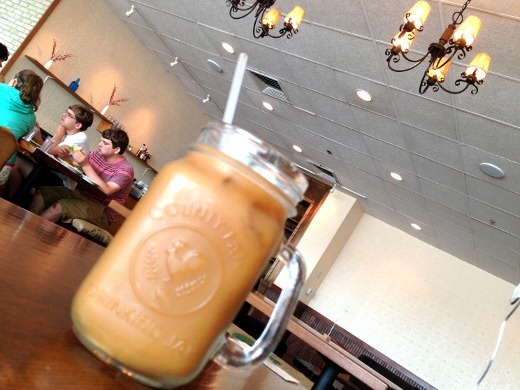 The Songbird Café is a warm, charming, and tasty breakfast or lunch option on Ann Arbor northeast side. Their sandwiches and soups are awesome too! Tastes like carrot cake except it’s made with banana and crushed pinapple instead of carrots, with that same ol’ good cream cheese frosting.